1. 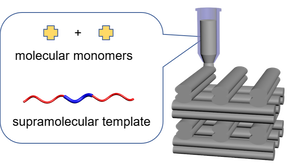 M. Zhang, L. Li, Q. Lin, M. Tang, Y. Wu, and C. Ke,* "HierarchicalCo-assembly-enabled 3D-Printing of Homogeneous and Heterogeneous Covalent Organic Frameworks" ​​J. Am. Chem. Soc., 2019, 141, 5154–5158. 10.1021/jacs.9b01561. 3. Q. Lin, L. Li, M. Tang, X. Hou, and C. Ke,* "Rapid macroscale shape morphing of 3D-printed polyrotaxane monoliths amplified from pH-controlled nanoscale ring motions" ​​J. Mater. Chem. C, 2018, 6, 11956-11960. DOI: 10.1039/c8tc02834f. "An Elastic Hydrogen-bonded Crosslinked Organic Framework for Effective Iodine Capture in Water"
2. Q. Lin, X. Hou, and C. Ke,* "Ring Shuttling Controls Macroscopic Motion in a Three-Dimensional Printed Polyrotaxane Monolith"
​Angew. Chem. Int. Ed., 2017, 56, 4452 – 4457. DOI: 10.1002/anie.201612440. 1. C. Ke, "Nanomachines: A light-powdered clockwork" ​​Nature Nanotechnology, 2017, 12, 504-506. DOI:10.1038/nnano.2017.44. X. Hou, C. Ke, Y. Zhou, Z. Xie, A. Alngadh, D. T. Keane, M. S. Nassar, Y. Y. Botros, C. A. Mirkin, and J. F. Stoddart,* Chem. Eur. J. 2016, 22, 12301-12306.
doi: 10.1038/ncomms7884. Highlighted by The Wall Street Journal, C&E News, Chicago Tribune, ﻿Chemistry Views﻿, The Conversation, BBC Focus and many others. C. Cheng, P.R. McGonigal, S.T. Schneebeli, H. Li, N.A. Vermeulen, C. Ke, J.F. Stoddart,* Nature Nanotechnology 2015, 10, 547–553. doi:10.1038/nnano.2015.96. J. Han , X. Hou, C. Ke, H. Zhang, N. L. Strutt, C. L. Stern, and J. F. Stoddart,* Organic Letters, 2015, 17, 3260-3263. B. Sookcharoenpinyo, E. Klein, C. Ke and A. P. Davis,* Supra. Chem., 2013, 25, 650-655. C. Yang, C. Ke, W. Liang, G. Fukuhara, T. Mori, Y. Liu and Y. Inoue,* J. Am. Chem. Soc., 2011, 133, 13786-13789. doi: 10.1021/ja202020x. Q. Wang, C. Yang, C. Ke, G. Fukuhara, T. Mori, Y. Liu* and Y. Inoue,* Chem. Commun., 2011, 47, 6849-6851. doi: 10.1039/c1cc11771h. L. Li, C. Ke, H.-Y. Zhang and Y. Liu,* J. Org. Chem., 2010, 75, 6673-6676. doi: 10.1021/jo100905j. C. Ke, C. Yang, W. Liang, T. Mori, Y. Liu* and Y. Inoue,* New J. Chem., 2010, 34, 1323-1329. doi: 10.1039/c0nj00131g. C. Ke, C. Yang, T. Mori, T. Wada, Y. Liu* and Y. Inoue,* Angew. Chem. Int. Ed., 2009, 48, 6675-6677. doi: 10.1002/anie.200902911. Y. Liu,* J. Shi, Y. Chen and C. Ke, Angew. Chem. Int. Ed., 2008, 47, 7293-7296. doi: 10.1002/anie.200802805. Y. Liu,* C. Ke, H.-Y. Zhang, J. Cui and F. Ding, J. Am. Chem. Soc., 2008, 130, 600-605. doi: 10.1021/ja075981v. Y. Liu,* C. Ke, H.-Y. Zhang, W.-J. Wu and J. Shi, J. Org. Chem., 2007, 72, 280-283. doi: 10.1021/jo0617159. C. Ke, S. Hou, H.-Y. Zhang, Y. Liu,* K. Yang and X.-Z. Feng,* Chem. Commun., 2007, DOI: 10.1039/b704279e, 3374-3376. doi: 10.1039/b704279e. H. Wang, R. Cao, C. Ke, Y. Liu,* T. Wada and Y. Inoue,* J. Org. Chem., 2005, 70, 8703-8711. doi: 10.1021/jo051073+. Y. Liu,* H. Wang, Y. Chen, C. Ke and M. Liu, J. Am. Chem. Soc., 2005, 127, 657-666. doi: 10.1021/ja046294w.